Free Shipping Included! 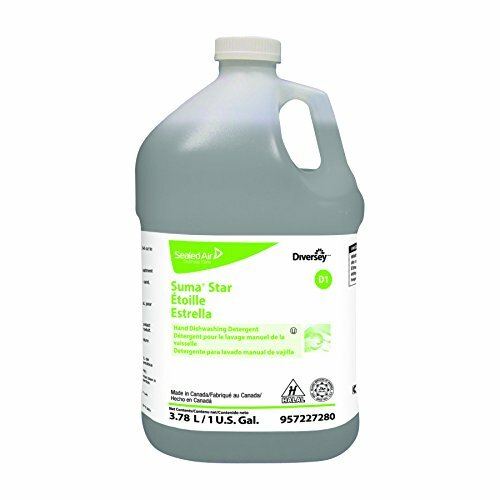 Save 1% on the Diversey Suma Star D1 Dishwashing Detergent (1-Gallon, 4-Pack) by Diversey at Blog Free Here. MPN: 957227280. Hurry! Limited time offer. Offer valid only while supplies last. Tackle tough clean-up and maintenance jobs with Suma's broad range of professional strength cleaning products, perfect for the home or workplace. Tackle tough clean-up and maintenance jobs with Suma's broad range of professional strength cleaning products, perfect for the home or workplace. Suma Star D1 Dishwashing Detergent is a mid-range detergent that's perfect for cleaning pots, pans, china, glass, and all washable utensils--both at home and in professional kitchens. Its blend of nonionic and anionic surfactants cut through grease and dried-on food for easy cleaning and streak-free rinsing. This concentrated formula is highly economical, plus its stable lather provides long-lasting suds. Cuts through tough grease and grime without drying out skin. This package contains four one-gallon bottles of Suma Star D1 Dishwashing Detergent. Suma Star D1 Dishwashing Detergent is a mid-range detergent that's perfect for cleaning pots, pans, china, glass, and all washable utensils--both at home and in professional kitchens. Its blend of nonionic and anionic surfactants cut through grease and dried-on food for easy cleaning and streak-free rinsing. This concentrated formula is highly economical, plus its stable lather provides long-lasting suds. Cuts through tough grease and grime without drying out skin. This package contains four one-gallon bottles of Suma Star D1 Dishwashing Detergent.